"Materials for the Study of Interesting Phenomena of Solidification on Earth and in Orbit"
MEPHISTO is a cooperative American (Materials Science and Engineering Department of the University of Florida UF/MSE in Gainesville, Florida) and French (Centre National D'Etudes Spatiales CNES in Toulouse, France) investigation of the fundamentals of crystal growth, using a materials processing furnace designed and build by the French. Scientists will study changes in solidification rates, temperature, and interface shape of an alloy to understand how these changes affect composition and properties of the metal produced. ARS is the primary subcontractor responsible for manufacture of all ground based sample tubes (GST's) and master alloy tubes (MAT's) used for both pre-mission ground tests and actual flight samples. 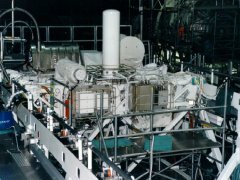 Each flight tube containing the alloys (Bismuth-Tin) to be used in flight were examined and approved by CNES in France prior to loading onboard the MEPHISTO furnace. 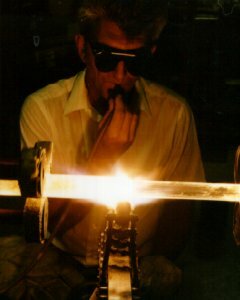 Each tube is hand crafted by skilled glass workers to exacting specifications and fully flight qualified for transport on the Space Shuttle Orbiter. The presence of chemical non-uniformities and physical imperfections significantly affect the quality of semiconductor crystals grown on Earth; and, as a result, affect the performance of electronic devices used in industrial, military, and consumer electronic equipment. The crystal growth process is complicated by gravity-induced factors. Processes cannot be properly evaluated from the results of experiments on Earth because the effects of one of these factors, convection (flows or movements within a liquid or gas), masks the underlying effects scientists need to study. These flows are are effectively eliminated in microgravity, making it easier to understand the growth process. 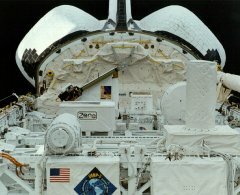 The experiments conducted during the STS-87 / USMP-4 mission are the primary responsibility of the University of Florida's (Gainesville, Florida) Dept. of Material Science & Engineering (UF/MSE), supervised by the Principal Investigator & MSE Dept. Chairman: Dr. Reza Abbaschian. The UF/MSE project engineer for this experiment is Dr. David Allen, who was responsible for the experimental design, all ground based tests, and production of actual flight samples flow on STS-87. UF/MSE engineers, along with French scientists, headed by Dr. Gerald Cambon (French Project Manager), will conduct the post-flight analyses on the samples. 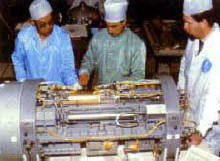 The photograph below shows Scientists preparing the MEPHISTO payload. The canister has now been placed on the palette which was installed in the Orbiter at John F. Kennedy Space Center, Florida. 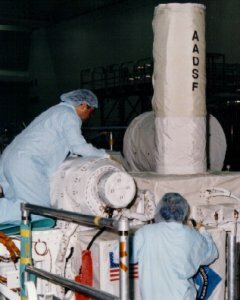 The MEPHISTO palette was one of the first Orbiter payloads to be processed in the newly completed Space Station Processing Facility at KSC. Here the payload can be seen during its flight on the STS-87 mission. MEPHISTO is at the lower left of the cargo bay.